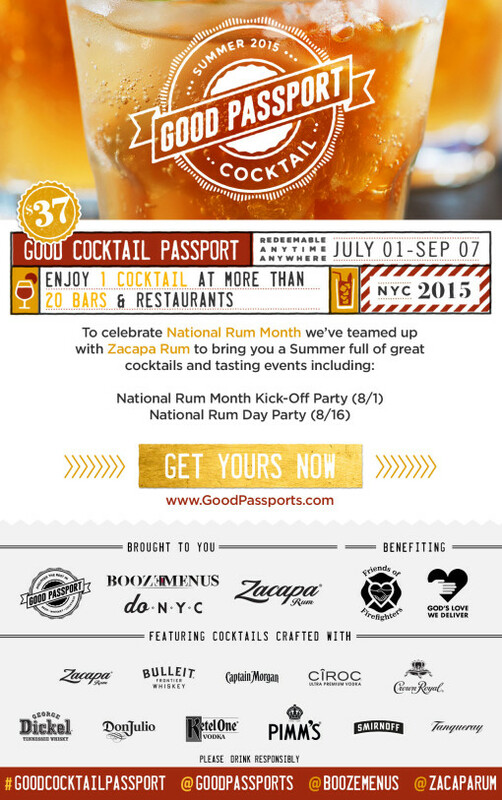 In celebration of National Rum Month (August), Good Passports, BoozeMenus and Zacapa Rum have teamed up to present the Summer Good Cocktail Passport, which will raise funds for God’s Love We Deliver & Friends of Firefighters with support from doNYC. By purchasing a Summer Good Cocktail Passport, you’ll get one summer-themed cocktail, featuring either Zacapa Rum or another one of the participating spirits brands, at every location. Cocktails are based on 1 oz pours of liquor. You may elect to have your spirit poured neat. You can use the Passport on any day, at any time from July 1 through September 7th, 2015. When purchasing a Summer Good Cocktail Passport, choose the location where you would like to pick up your Passport. Passports are available for pick-up from July 1 through July 31, 2015. Buy a ticket for your preferred Passport pick-up location. Pick up your Passport at the location you chose any day from July 1 through July 31, 2015. Bring your Passport to each of the 21 participating locations any day from July 1 through September 7, 2015 and choose one cocktail from a participating brand at each location. Let’s taste some rum!!!! That sounds like a great way to kick-off National Rum Month, right? Join us on Saturday, August 1st at Back Label Wine Merchants for a grand-tasting of different rum cocktails. Zacapa Rum has helped us put together an event where you’ll get to sample several different specialty rum cocktails and tiki drinks. You’ll also get to taste a surprise Zacapa Rum infused treat and cheese from Stinky Bklyn. All you need is a Good Cocktail Passport! If you have already purchased a Good Cocktail Passport or would like to pick one up before the event, all you need to do is RSVP. If you would like to pick up your Good Cocktail Passport at the National Rum Month Kick-Off Party, please purchase the corresponding ticket. You will need to pick up your Passport at the event during the 3:30 pm session. 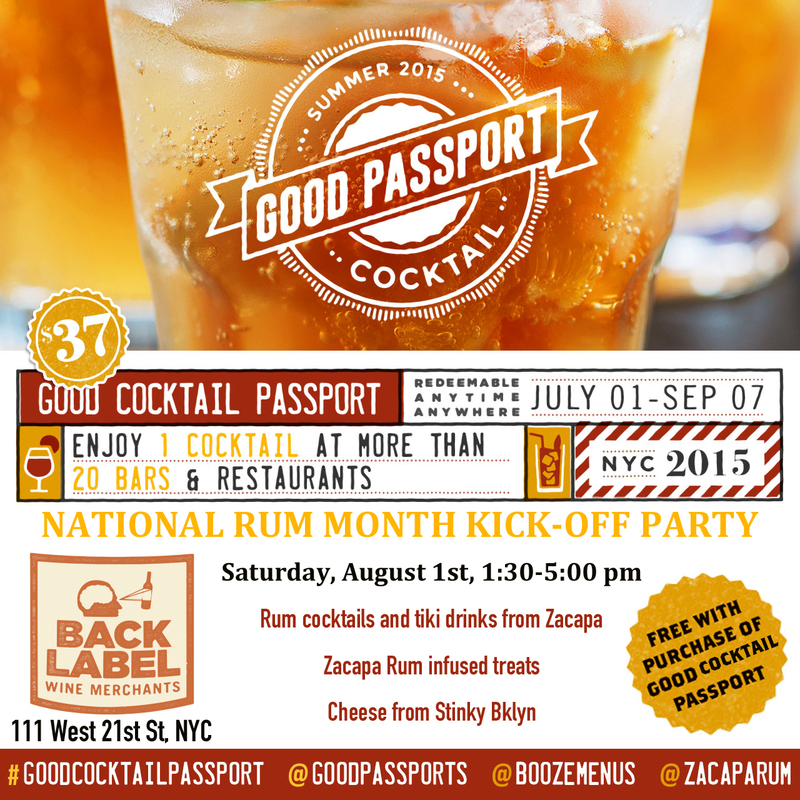 To RSVP for the National Rum Month Kick-Off Party follow the instructions included in your Good Cocktail Passport Confirmation email from Eventbrite. *Spirits are subject to availability. Participating locations reserve the right to alter spirit selection in the event of limited supply. Handcrafted with the utmost care in Guatemala, Zacapa Rum is produced using only the first pressing of sugar cane juice or “virgin sugar cane honey.” Expertly aged 7,500 feet above sea level in the Highlands of Guatemala, Zacapa Rum develops its characteristic color, body, flavor and aroma in a consistent cold temperature and high altitude that helps facilitate the aging process and influences the final taste profile of the rum. The complexity and intensity of flavors and aromas are developed through the intricate Sistema Solera process, turning bespoke craftsmanship into an acclaimed ultra-premium spirit. God’s Love We Deliver is the New York City metropolitan area’s leading provider of nutritious, individually-tailored meals to people who are too sick to shop or cook for themselves. Founded in 1985 when one woman began delivering food on her bicycle to a man dying from AIDS, God’s Love now cooks 4,600 meals each weekday, delivering them to clients living with life-altering illnesses in all five boroughs of New York City, Newark and Hudson County, New Jersey. All of our services are provided free of charge to our clients, their children and to the senior caregivers of our senior clients, without regard to income, and we have never maintained a waiting list. Because we believe the combination of hunger and serious illness is a crisis, we deliver food within 24 – 48 hours of first being contacted.